Video footage and pictures: The three Strzelecki murderers arrive at court during August 2017. The escaped murderers are the man in the red sweat suit top and the shorter man in a white shirt. No images are available for Matias and Ngenokesho yet. The Namibian Police have launched a country wide man-hunt for four dangerous criminals, all accused of brutally murdering their victims, who escaped from the holding cells at Swakopmund Police Station on Monday. In this regard the Namibian Police in the Erongo Region have requested the public to assist them in recapturing the murderers. Two of the escaped murder accused, the 24-year-old Stefanus Daniel Nghilifa and the 24-year-old Fabianus Lazarus along with Jerobiam Simon Shidute, are accused strangling and bludgeoning Roswietha Strzelecki, who was 78 at the time of the murder, to death in her home. Her husband Siegfried Strzelecki who was 82 at the time, died in hospital a week after the brutal attack due to serious injuries he sustained during the brutal attack. The vicious attack occurred during early August of 2017. According to the Erongo Regional Crime Investigations Coordinator, Deputy Commissioner Erastus Iikuyu, Nghilifa and Lazarus along with Nujoma Matias (25) and Stefanus Ngenokesho (23) escaped on Monday after the managed to cut open the bars over their cell window with an unknown object. 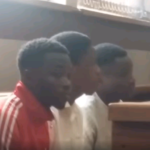 He said Matias and Ngenokesho are accused of stabbing a man to death at a club in the Kuisebmond neighbourhood during 2016. Deputy Commissioner Iikuyu requested any person with information regarding the whereabouts of the escaped murderers to contact him at 081 246 4757, Detective Warrant Officer Hermuth Marine at 081 765 3608 or Detective Sergeant Gariseb at 081 203 1808 or to report to the nearest Police Station.